Earlier last year, we announced bookmarking to be generally available in Power BI Desktop. Bookmarks are currently used by many report authors to share interesting insights, tell a story, and create intuitive navigation elements within a report. Since its introduction, one of the biggest requests we’ve consistently received from the Power BI community is to expose this capability to report consumers and allow them to define their own bookmarks to suit their individual needs. Today, I’m thrilled to announce the general availability of personal bookmarks in the Power BI service. As a report consumer, you will now be able to create your own set of bookmarks for each report by capturing various states of a report page (including filters, slicers, and state of visuals), give them friendly names, and later return to each state with just one click! Not only that, you will also be able to make any bookmark that you create the default view, so you can land on your favorite view of the report every time you open it. Excited? Read on for more details. Or, head directly to any report in the service to try it out for yourself. Note: We will be starting to roll out the feature this week. It should be enabled for all users by January 24, 2019. To see personal bookmarks in action, go to any Power BI report that you have view or edit access to. You will notice a new drop-down in the action bar that says “Bookmarks”. Once you have modified the report to the view that you like, simply expand the Bookmarks drop-down and select Add personal bookmark. By default, the service will suggest a generic name for your bookmark, but you can simply type in your friendly name and select Save. And that’s it! Once you have a bookmark, you can display it by simply clicking on the bookmark name in the drop-down. You will notice that the breadcrumb for the report will now contain the bookmark you are currently viewing. Note: You will be able to create a maximum of 20 bookmarks per report. If at any point you want to clear the bookmark and return to the published view of the report, just select the Reset to default button and hit yes to the dialog; it is the same workflow as persistent filters. Whenever you leave and return to a report, the current persistent filters feature (if enabled by author) shows your report with the filters and slicers set as you left them, making it easy for you to pick up where you left off. However, there are many cases where you might not necessarily want that and would rather land in a pre-configured view of the report to begin your analysis. With personal bookmarks, you can now do just that! When creating a personal bookmark, you will have an option to set your current view as the default view by selecting the Make default view checkbox. Now, whenever you leave and return to the report, this will override the persistent filter state and land you in the view that you specified. You will notice that a default bookmark has a different icon compared to the other bookmarks that you may have captured in the report. In addition, you can easily rename, delete, update, and choose a default bookmark by selecting the ellipses next to the bookmark’s name, then selecting an action from the menu that appears. 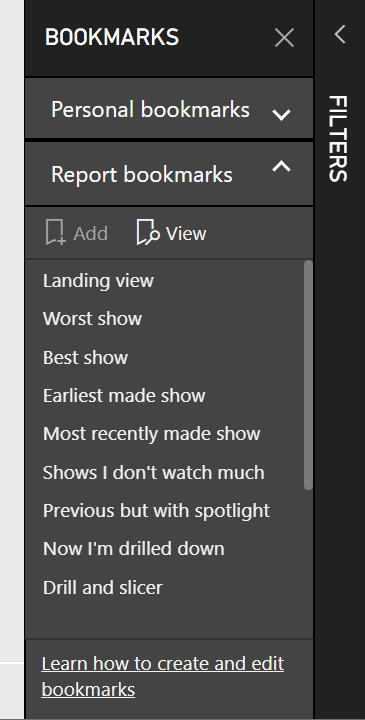 If you want to access additional bookmarks that may have been published by the author of the report, you select Other bookmarks in the Bookmarks drop-down menu to launch the Bookmarks pane. All the bookmarks created by the author will be nested under the “Report bookmarks” heading. Try out the feature! Head on over to Power BI service and go to your favorite report to create a bookmark. Note that we’re still rolling out the feature worldwide, so you may have to wait until the end of the week to see it in action for your tenant. With this release, you will not be able to share any personal bookmarks. It’s on our roadmap and we’ll be working on enabling it soon! Hang tight – personal bookmarks are also coming to all of our mobile apps shortly.